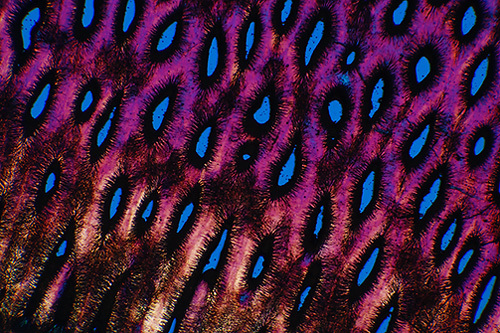 'Polar animals' - photomicrographs of subjects from the animal kingdom under polarised light. 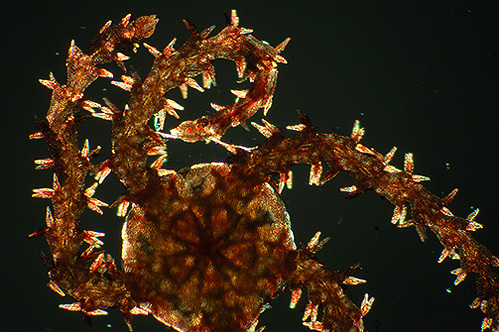 Like many microscopy enthusiasts I never tire of 'polar exploration'—in comfort—but do admire the true polar explorers who have the opportunity to experience the wonders of the Arctic or Antarctic. 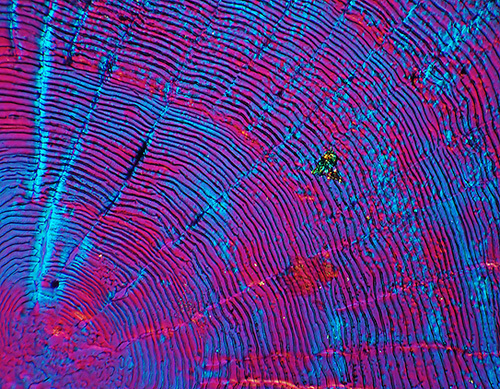 For the indoor 'polar explorer', crystals are one of the most popular subjects for polarised light studies under the microscope and Brian Johnston's series The colourful world of chemical crystals shows the wealth of possibilities to great effect. A wide variety of subjects from the animal kingdom can also give attractive images, e.g. preparations of teeth, bone, insect exoskeletons can benefit from polarised light. Below is a selection of images of such subjects from the author's modest slide collection. Victorian slides were often marked 'polar' or 'for the polariscope' when they realised the subject would benefit from this sort of lighting but with modern unmarked 'animal kingdom' slides it can be easy to overlook using polarised lighting to explore a subject. So hopefully the following examples may encourage readers to explore their slide collection to study suitable subjects. As has been demonstrated by many contributors, almost any microscope can be adapted for simple polarised light subjects even if not ideal for it; a variety of methods can be found described in the Micscape Library Lighting Techniques-Polarisation section. The author's own microscope is not dedicated to polar, but a third party polariser and analyser was inserted above and below the microscope slide with additional 'tint plate' where necessary. 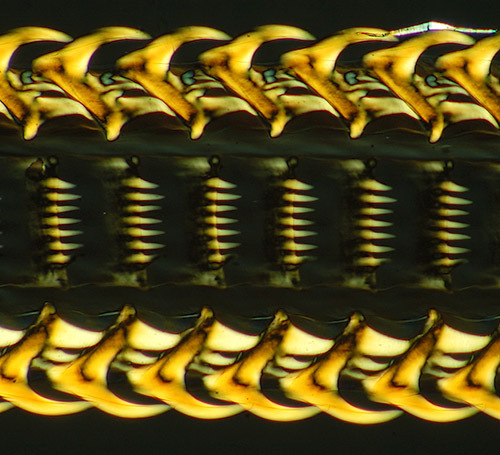 Images were taken with a Nikon D50 DSLR body on a Zeiss Photomicroscope III using the spare photo port. The projection eyepiece was a Zeiss 10x Kpl W on a 12 mm collar. The camera was set for parallax focus with the remaining binocular eyepiece using the dioptre adjustment (a quick but effective way of achieving parallax). At low power, critical focus can be tricky and direct image transfer with Nikon Capture software to the PC allowed slight adjustments to the focus to be made. With the low power 2.5x and 4x objectives used, I did not find any significant mirror vibration problems on the Photomic when using the built-in tungsten lighting with a wide range of shutter speeds despite the fact that the D50 lacks mirror lock (the very sturdy stand probably helps!). I have noticed vibration effects for higher power work where I exclusively use flash. Apart from resize and sharpening to compensate, the images are pretty much 'out of camera'; the Nikon D50 and Zeiss optics seems a good combination, giving contrasty results without the flattening of image contrast I have experienced before with the LOMO Biolam. One objective I've had no success at all with for photomicrography is the Zeiss planachro 1x/0.04. As well as a large awkward non-parfocal objective when on the turret, I've found it very difficult to achieve sharp images as depth of focus at sensor is minute. The low NA shows as well with images lacking bite. Stitching images from the 2.5x is a better route. Visual images are quite pleasing though with the 1x for the 'bigger picture' without need for slide scanning. Radula of a snail: This is one of the classic subjects for polarised light studies and often seen in Victorian slide collections although they seem to be less popular nowadays but I do have a few modern examples by Biosil (John Wells). The snail uses its radula for rasping food off surfaces to bring the food to its mouth. The four Victorian examples I have lay out the radula linearly and illustrates even by eye its size, in my examples they are up to 20 mm long and 1-4 mm wide depending on species. 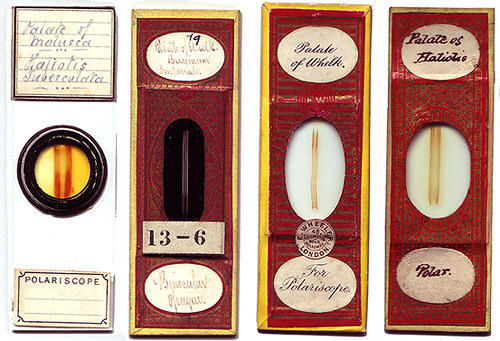 Typical Victorian palate/radula mollusca slides. The second from left is for incident lighting. 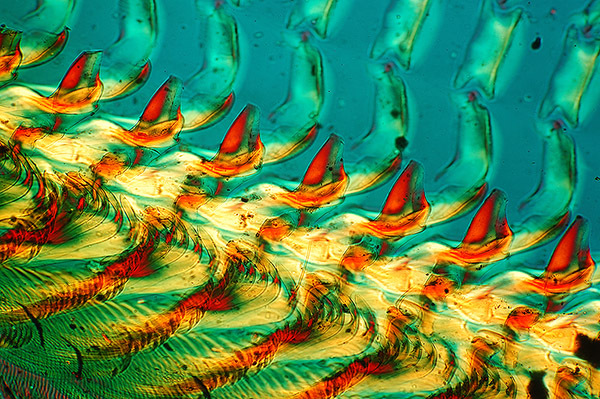 'Palate of whelk', mounted by Wheeler, papered slide, crossed polars, Zeiss 2.5x planachro, 1/10th sec. Crop of full frame. As above but with crossed polars and lambda tint plate, Zeiss 2.5x/0.08 planachro. Tint plates for aesthetic images I think need to be used with care as the fierce blue or pink background created can be more dominant than the subject but for some subjects with strong shapes the clash of colours can work. A low power objective such as 2.5x used above shows the gross structure but worth exploring smaller areas at a higher power to see what imaging possibilities are revealed. Incidentally if the tint plate is not of high optical quality, as in this instance, it can be used below the stage above the polariser. Cellophane films of various thickness can be tried. 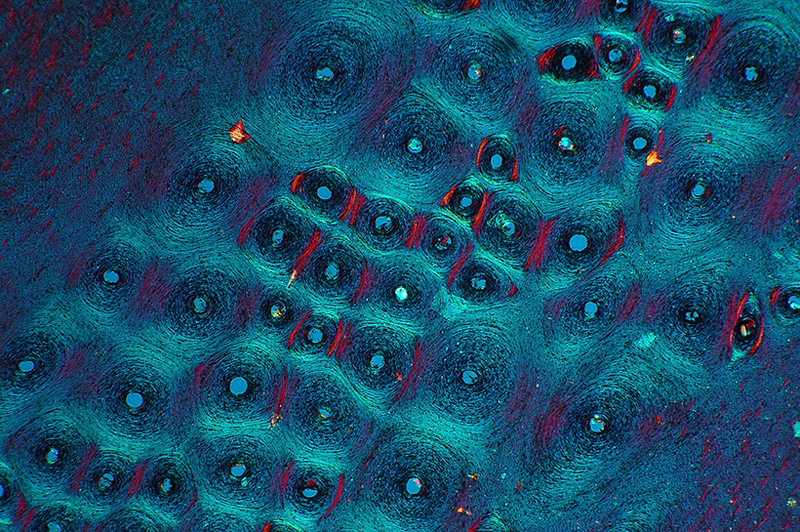 'Palate of haliotis', unnamed Victorian mount, papered slide, crossed polars, lambda tint plate, Zeiss 4x/0.16 planapo. This subject was angled for a more dramatic effect and the condenser iris was stopped down more than usual to retain some of the depth of the 'teeth'. Bone. Such subjects can be attractive under polarised light and well worth exploring. The example below is 'whalebone' which often crop up in old slide collections. Not a very politically correct subject nowadays unless responsibly sourced. I'm not entirely sure how the Victorian mounters sourced their material but a type of slide to be enjoyed nevertheless. 'Section of whale-bone', transverse, Polariscope'. Unnamed Victorian mount. Crossed polars, lambda tint plate, Zeiss 4x/0.16 planapo. Insects: The exoskeleton of insects can be active under polarised light. In my own collection some insect mounts are almost completely inactive whereas others are very active; I'm not too sure of the reasons for this, perhaps the thickness of the exoskeleton or variations in composition; suggestions welcomed. The example below is a flea whole mount. 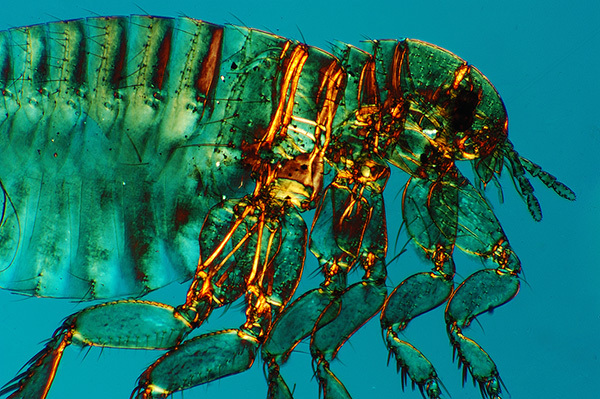 Human flea, Pulex irritans, male. Crossed polars, lambda tint plate. Zeiss 2.5x planachro. This is a well cleared and laid out Victorian mount but unnamed. The crop factor of a DSLR cf. visual field and not entirely suitable projection eyepiece proves awkward here, the insect doesn't fill the frame. 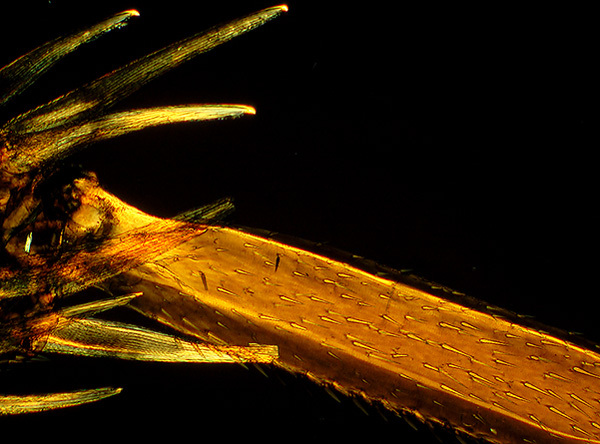 Another example below is detail from a cockroach leg, with crossed polars and another part of same leg with a tint plate. 'Leg of cockroach', 'Blatter' (the Victorian mounter?) Crossed polars. Zeiss 2.5x planachro. 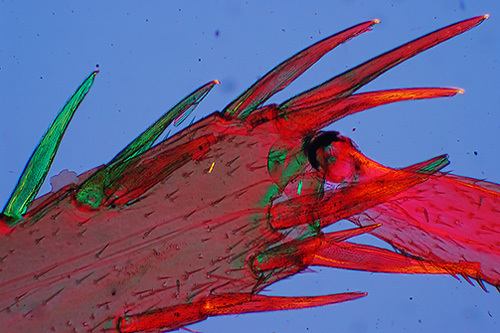 'Leg of cockroach' (another part of leg), crossed polars, lambda tint plate. Zeiss 2.5x planachro. For me the tint plate for this image doesn't work, the colour combination is too garish and much prefer the gold lustre above of crossed polars; also avoids the need to tidy up all the dirt in the slide the tint plate shows. Whole mounts. Starfish: Any whole mount is worth trying to see if if parts or the whole respond to polarised light. Below is a tiny starfish 3.5 mm across. 'Starfish'. Crossed polars. Unnamed Victorian mount. Zeiss 2.5x planachro. 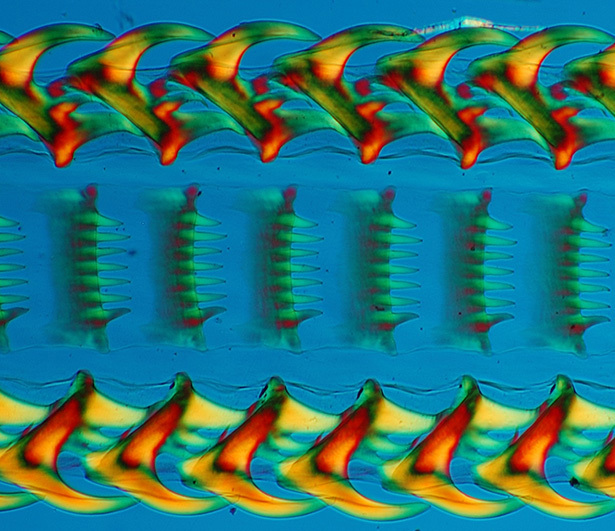 Fish scales: These are worth a study under crossed polars. The example below is of a bream. 'Bream scales of Cyprinus clicca.' Crossed polars, lambda tint plate. Unnnamed Victorian mount dated 13/3/71 (1871). Zeiss 2.5x planachro. (This species name brings up no hits on Google so maybe outdated or spelling variant. Cyprinus is a genus of carp). Tooth: Mounted teeth are another subject worth trying. 'Tooth of Myliobates, Eagle Ray. Transverse section'. Unnamed Victorian mount. Crossed polars, lambda tint plate. Zeiss 2.5x planachro. Wikipedia's 'Eagle ray' states that Myliobatis is the genus of the 'common eagle rays. ... just try it and see, is the key to rewarding indoor 'polar exploration'. Any idea what the subject below is? Answer below. 'Section of human nail. Polar'. Crossed polars, lambda tint plate. Zeiss 2.5x planachro. Unnamed Victorian mount. Published in the July 2006 edition of Micscape.